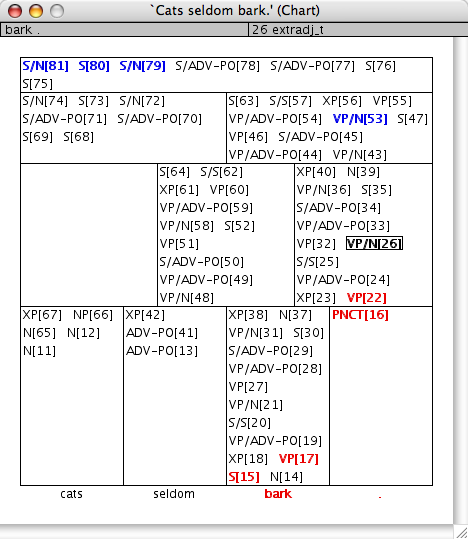 Parsing systems typically use a chart as an organizational device to keep track of partial analyses of input sentences. An analysis of a constituent in an input is referred to as an edge, and the chart consists of a collection of edges, typically organized according to length and string location. The layout of the chart browser is clean and intuitive. The parse chart is displayed as a stack of rows, one for each constituent ("edge") length considered. The top row corresponds to edges spanning the entire sentence (say of length N), consisting of only a single cell. The next row contains edges spanning N-1 tokens, and is broken into two cells; the left cell contains edges starting at the beginning of the input, and the right cell contains edges aligned with the end of the input. The chart extends downwards in a similar fashion, with shorter edges on each row, terminating in the bottom row with edges of length 1, and a cell for each starting string position. The parent/child relationship between edges is not immediately visible in the display; charts tend to be rather large even without adding criss-crossing lines all over the screen, and with lines showing all relationships, parse charts would be much too large. This crucial information is, however, less than a click away! When the user moves the mouse pointer over an edge in the chart, LUI hilights all of its descendents and parents (see the screenshot). This makes it easy to see the internal structure of the chart, while maintaining a tidy view. Shows the AVM for the edge. Requests a tree display with the selected edge as the root, and the edges used to build it as its children. Locks the mouse-over highlighting until the next click. Highlights immediate parents and children until until the next click. Removes all edges built on this edge from the chart, until unfiltered. Applies the Filter command to all other edges in the same cell as this edge. Filters all edges not related to this edge by a (transitively closed) parent-of or child-of relationship. Summons the TDL source for the grammar rule or lexical entry of this edge in Emacs. Right-clicking on the surface forms at the bottom of the chart offers a list of the lexemes in the chart which represent it. Selecting one of the lexemes filters the others, and selecting All Lexemes reverses this. Right-clicking on the background of the chart offers two additional options. Reset Filters clears all filtering action, resulting in a chart with all of the edges visible. Fork Browser opens a new chart browser window containing the same filtering settings as the source window, which can be manipulated independantly. Like the LuiAvm browser, the chart browser support interactive unification, i.e. dragging a chart edge and dropping it onto a feature (sub-)structure in another LUI window to request unification of the two structures with failure recording. See the LuiUnification page for details.